When it comes to the critical question of the 2018 gubernatorial election, Democrat Antonio Villaraigosa was the leading candidate among Latino voters with 39% compared to 15% for Democrat Gavin Newsom. Still, both front-runners were leaving a lot of Latino votes up for grabs with 23% favoring another candidate and 22% saying they were undecided. Thus, the pivotal Latino vote remains in flux heading into the primary, with Villaraigosa perhaps best poised to capture the lion’s share. 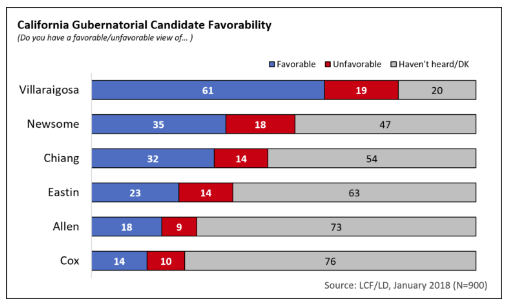 Overall, Villaraigosa carried a 61% favorable rating, compared to 19% unfavorable, for a net +42 favorability among Latino voters with 19% stating they had no opinion of the former Los Angeles mayor. Fellow Democrat Gavin Newsom had 34% favorable against 18% unfavorable, for a net +16 favorability rating, but a large percent – 48% – said they had no opinion of Newsom. 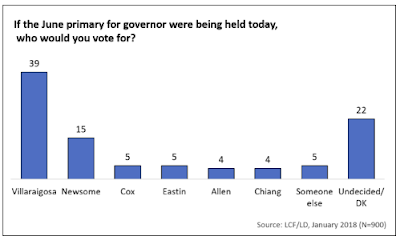 Likewise, other candidates for Governor found themselves with a majority of Latino voters stating “no opinion” with 55% giving no rating of Democrat John Chiang, 64% for Democrat Delaine Eastin, 75% had not heard of Republican John Cox, and 73% had no opinion of Republican Travis Allen. In their evaluations of the political parties, just 17% said the Republican Party was doing a good job of reaching out to Latino voters, while 46% said Republicans don’t care too much, and 31% thought Republicans were hostile towards Latinos. In contrast, 53% thought Democrats were doing a good job in their outreach, far better than Republicans, but also far lower than the 83% favorability rating given to former President Barack Obama, suggesting Democrats have work to do in shoring up the Latino vote. In terms of public policy, Latino voters in California said the top issues they expected the next Governor to address are immigrant rights, creating jobs and improving the economy, increasing investment in public schools, expanding access to health care and encouraging affordable housing. All of these issues will be discussed at the 2018 Gubernatorial Forum hosted by the Latino Community Foundation and Univision on January 25, 2018. The Poll was conducted by Latino Decisions and funded by the Latino Community Foundation and The San Francisco Foundation.